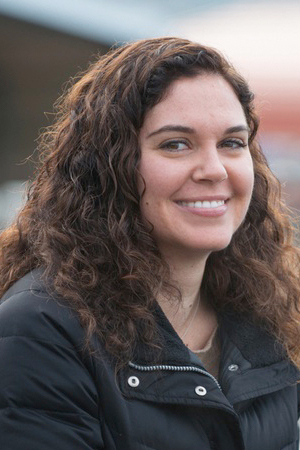 Heather Galindo put down the pipettor to become the Assistant Director of Science at COMPASS in 2010. Since then she has greatly enjoyed learning about a dizzying array of research from numerous amazing scientists. In this post she tells us about the Message Box and how it can help us focus our science communication. Recently, I rediscovered a description of my PhD research produced at a COMPASS training I attended in 2006. I deciphered my messy handwriting to find that I had used the analogy of how people move between cities to explain why I used DNA to track movements of marine plankton between populations. In both cases, understanding how many and how often individuals change locations can inform what might happen if these connections are disrupted. (Think about a freeway shutting down between San Francisco and Los Angeles.) As movement between places is reduced, so is the flow of goods and services, thereby isolating populations. 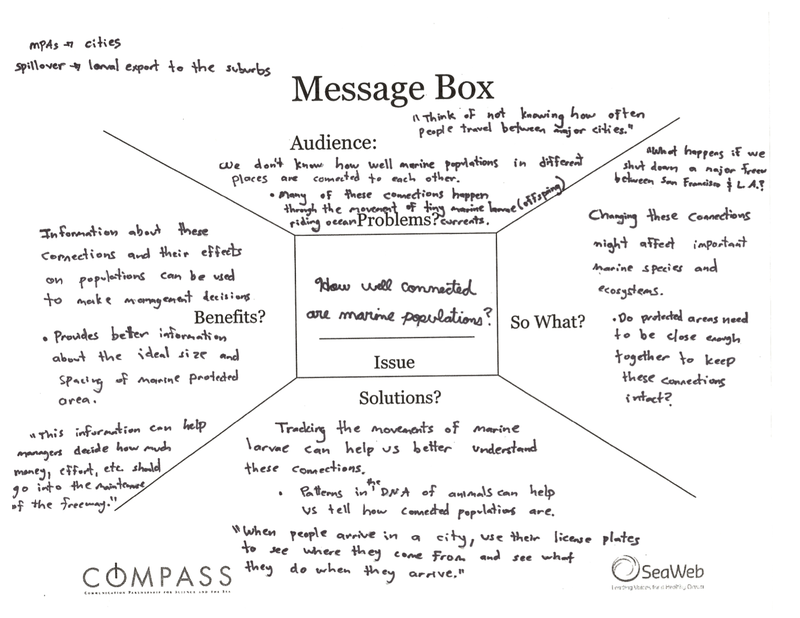 It turns out that my early attempts at finding the “so what” of my science used the very same tool that we still use at COMPASS today: The Message Box. At all COMPASS trainings (which typically range from half-day to three-day events), the Message Box is how we help scientists distill their science into the most essential and intriguing pieces. These are the key ideas with which you can build a firm foundation of understanding about your research in conversation with almost any audience. It’s not about dumbing anything down. Instead, the Message Box illuminates the heart of your science and inspires your audience to want to learn more. It’s tempting to describe your work in very general terms in an effort to avoid overwhelming details, but your audience needs specifics to understand your particular contribution to the issue. Like we recently heard from Erica Goldman seeing the story (and yourself as a character) in your science is hard… but essential. You have to find a balance between being accurate and compelling. Message Box refinement is an iterative process. Almost without exception, the final version often looks nothing like the first. And finally, feedback is critical! And most helpful when it comes from someone outside your discipline. Your lab mates are less likely to catch jargon and concepts unfamiliar to people outside your field. And, remember you are not alone! From past participants in our trainings (find them on Twitter) to members of the recent SciFund Challenge outreach training class (some bravely share their Message Boxes here), there is a growing community of scientists who are leading the way. This was originally posted on the COMPASS blog (which is separate from our website).